McKeirnan is a clinical assistant professor in the Department of Pharmacotherapy at the Washington State University College of Pharmacy and Pharmaceutical Sciences. McKeirnan was selected because of her work in improving immunization rates in rural areas, developing a model for implementing chronic disease-state management services in community pharmacies, and developing a pharmacy technician immunization training program. MacLean is a clinical professor and the vice dean for external relations for the Washington State University College of Pharmacy and Pharmaceutical Sciences. She is a past-president of the WSPA and a past trustee for the American Pharmacists Association. She currently serves as a board member and the vice-president for the Community Pharmacy Foundation, an organization dedicated to maximizing the community pharmacist’s role in improved patient care. 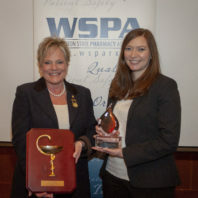 The WSPA advocates on behalf of its members to ensure pharmacy professionals are recognized, engaged and valued as essential to the health care team. Awardees are nominated by their peers and selected by a WSPA awards committee.